City Arts Nottingham develops art that brings people together, stimulates change and creates stronger, healthier communities. four profiles were found for City-arts.org.uk in social networks. Among other social networks the website is represented in Facebook, Twitter, GooglePlus and YouTube. The web server used by City-arts.org.uk is located near the city of San Francisco, USA and is run by CloudFlare. This web server runs a few other websites, mostly in the english language. 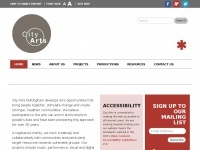 The websites of City-arts.org.uk are served by a Nginx server. The content management system WordPress in the version 4.4.1 is used. The HTML pages were created with the latest standard HTML 5. Due to the robot information on the webpage, the following actions by webcrawlers are not allowed: using the description of the website from the Open Directory project and using the description of the website from the Yahoo directory. All other actions by webcrawlers are allowed.